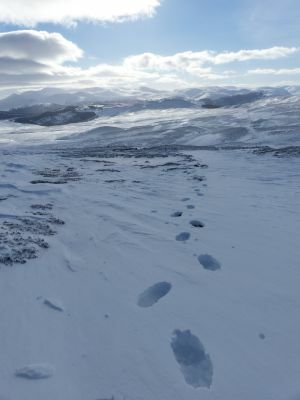 Walking in the Cairngorms National Park in the winter can be a magical ex perience; the colours, the light, the crisp, glistening snow on the mountains. It’s so inviting, and can be such an amazing experience. But walking in the winter hills does need a lot of preparation, skill and equipment to ensure you stay safe. Don’t underestimate how fast the conditions can change in winter it may be bright blue sky when you set off, but conditions can change in a split second, ensure you have appropriate warm clothing, layers, socks, boots, gloves and hats, and a really indispensable piece of kit is some goggles. As well as warmth, you’ll need a good outer shell. Down jackets are amazing, but in rain they can become heavy and cold. The guys at Braemar Mountain Sports are fantastic and can help with everything you need. Navigation is key. Ensure you are familiar with using an OS map and compass. GPS are a fantastic piece of kit but should be an additional piece of kit, not your soul piece of kit to rely on your walk. Mobile phones are also a fantastic addition to your kit list, but in the hills there may not be signal, your battery can drain fast, and if it’s all you are using to navigate you can be left lost. You can learn about Navigation by attending a course such as this one run by CN-Do Scotland or Glenmore Lodge. Be avalanche aware. Avalanches are very complicated entities which are dynamic and the conditions can change quickly. 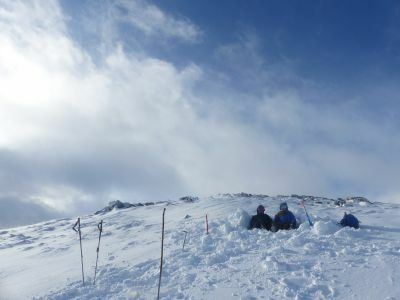 Avalanches can happen at any time, but it is a really good idea to become familiar with the Scottish Avalanche Information Service and also attend a winter skills course to get familiar with planning your walks depending on the conditions you are faced with. Check the weather forecast. You might book a holiday in the hills weeks in advance with the aim of walking 12 munros, but weather conditions can scupper your plans. Always be prepared to change your plans if the weather poses a threat. It’s always better to turn back and return in the future than risk getting in to difficulty. Leave a route card. It’s a good idea to leave a route card with someone detailing your route, when you set off, when you expect to return, and contact numbers. Daylight is limited so be realistic about how much time you have available for your walk. And always carry a torch and spare batteries in your bag. Using crampons and an ice axe. The snow may be fluffy and bright at the start of your walk, but up on the hills it can be sheet ice, and without an ice axe and crampons, may be completely inaccessible. You will need good winter boots to fit your crampons on, and also have knowledge on how to use your ice axe and crampons. It’s a brilliant idea to attend a winter skills course, such as one run by McDougall Mountaineering or The Mountaineering Council of Scotland. Don’t forget your camera and have fun. Invercauld Estate is home so some of Scotland's most iconic wildlife, which is a truly magnificent to witness in such an amazingly beautiful environment. At Braemar Caravan Park you don’t have to venture far to see Red Squirrels which can be seen foraging and caching for nuts and seeds to keep them going through the long winter. From our new view point you may be lucky enough to see Buzzards circling overhead, or sometimes catch a glimpse of the elusive and stunningly beautiful Golden Eagle. Mountain Hares transform from brown in to a bright white and can be seen surviving in the most harshest of environments. 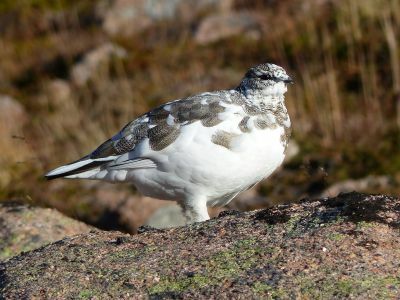 Ptarmigan are perfectly adapted to living high up in the mountains in the arctic conditions of the Cairngorms National Park, transforming their camouflage from the grey mottling of the granite to the bright white of freshly fallen snow. There are Tawny owls and Barn owls, Fieldfares, Red wings and so many more bird species all in search of food to keep them going through the cold winter. The Red Deer are also a spectacular sight in the Winter months. Their coat grows thick to keep them insulated from the harshest of temperatures, and they venture further down the hills in search of food to graze on. 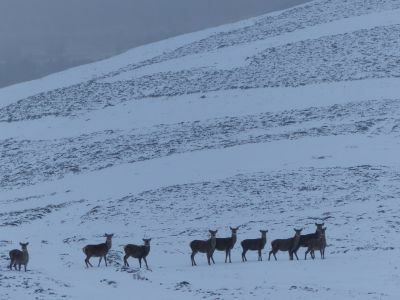 In winter herds of Red Deer hinds can be witnessed in their hundreds, whilst the stags tend to stick to smaller herds. Braemar Caravan Park is an ideal place to start your search for wildlife, there are paths and tracks that can be followed directly from the Caravan Park or just a short drive away, which will take you deep in to remote glens, along gushing rivers and waterfalls, through Caledonian forests or vast heather moorland. The Wardens at Braemar Caravan Park are passionate about the area and are always happy to give advice on routes to walk in the area. Winter has come early at Braemar Caravan Park, early November and the mountain tops are covered in a dusting of the white stuff. Not yet enough to ski on but more snow is forecast along with the ‘Polar vortex’ promising and extra cold winter. For those who have never ventured out in their caravan or motorhome (or tent) over the winter months, there’s worries of being cold, getting snowed in, being cut off etc. 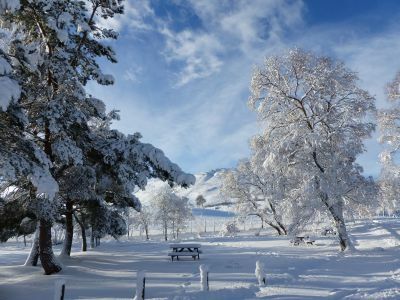 So how do you prepare for a winter adventure at Braemar Caravan Park? It is a good idea to prepare for winter conditions, even if there is no snow on the ground when you set off. Winter tyres are invaluable and will help give you traction when the roads become slippery. Have a snow shovel, ice scraper, warm clothes and a hot drink and some food to hand in case you do get delayed for a time. Once you’re at Braemar Caravan Park, we have a snowplough, snow blower to ensure access is kept as clear as possible and we grit the paths and roadways to help you get around the Caravan Park easier, but do be prepared that pavements and roadways can be slippery and some ice grippers on your shoes or a walking pole can help you stay upright. Temperatures can drop impressively overnight, and it is a good idea to have some kind of insulation for your aquaroll so ensure you can still get water in to your caravan. Finally, sit back and enjoy. Winter is a magical time to enjoy a break in your caravan or motorhome. Whether you enjoy walk, photography, watching wildlife or doing winter sports, there’s no better place to spent the winter time. Braemar Caravan Park opens for the winter season on 10th December 2016. Christmas and New year are a magical time here, peace and quiet and wonderful views of a winter wonderland. Glenshee Ski centre is just a short drive from Braemar Caravan Park and has a ski school, 22 ski runs for all levels of ability.